It was in 2010 that I was on my way to Rae Barelli, to India’s best flight school on the personal invitation of the director, Air Marshal (retd) “Charly” Verma. I honestly was excited. TB-20s, King Air C-90s, and to witness a host of things I had only heard about! Indira Gandhi Rashtriya Uran Akademi was calling! My route to the school was Bangalore-Mumbai, and from there Mumbai-Lucknow. From Lucknow I was to take a road transport for a distance of around 100kms. My Bangalore-Mumbai flight diverted to Ahmedabad , thanks to a VIP departure from Mumbai’s VABB that had disrupted the schedules for the day. When I returned to Mumbai from Ahmedabad, I had to wait quite a bit for another connecting flight to Lucknow. And that was when I was pleasantly surprised to see Capt. Rajnish Verma, walking in with his head held high, in uniform to operate a flight that day. 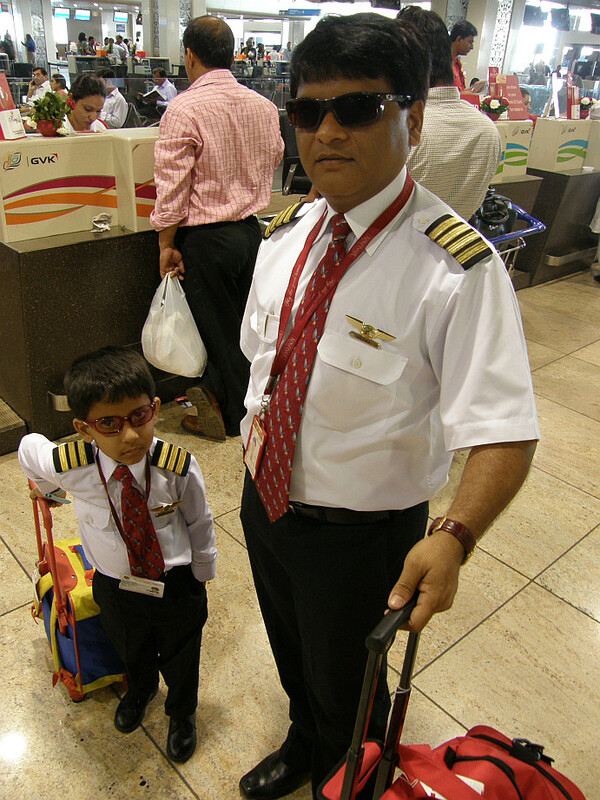 By his side, a smaller, cuter “first officer” Jr. Verma, in full Kingfisher Airlines’ uniform, pulling along his trolley school bag as the next best thing to his dad’s flight bag. I can never stop laughing at the kid’s ID card! Capt. Rajnish Verma was incidentally a former instructor at IGRUA, recruited by my grand-uncle, Air Vice Marshal (retd) Subbaramu. AVM “Subbu” himself was a director of IGRUA for a while. 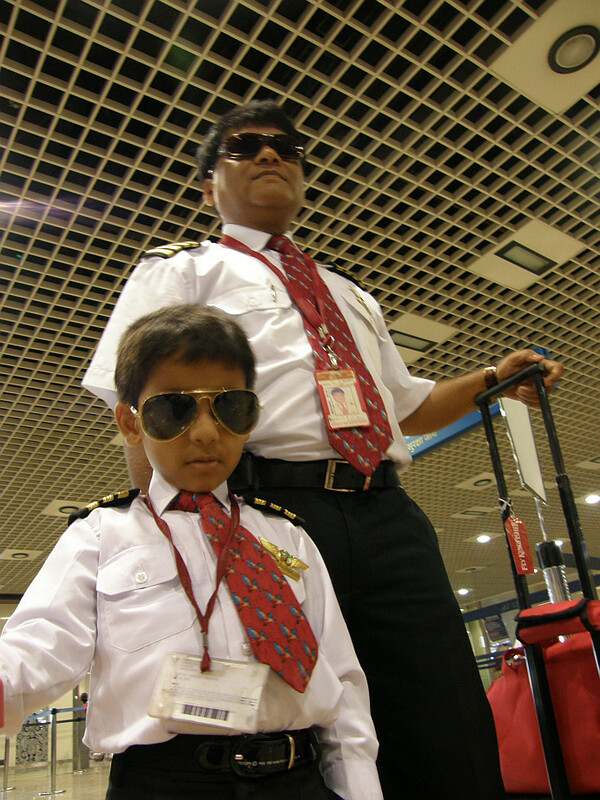 Capt Rajnish Verma and his son stormed into the terminal at Mumbai in style! A perfect crew: Commander and First Officer of a Fairy Tale airline! Can i get his phone no.? 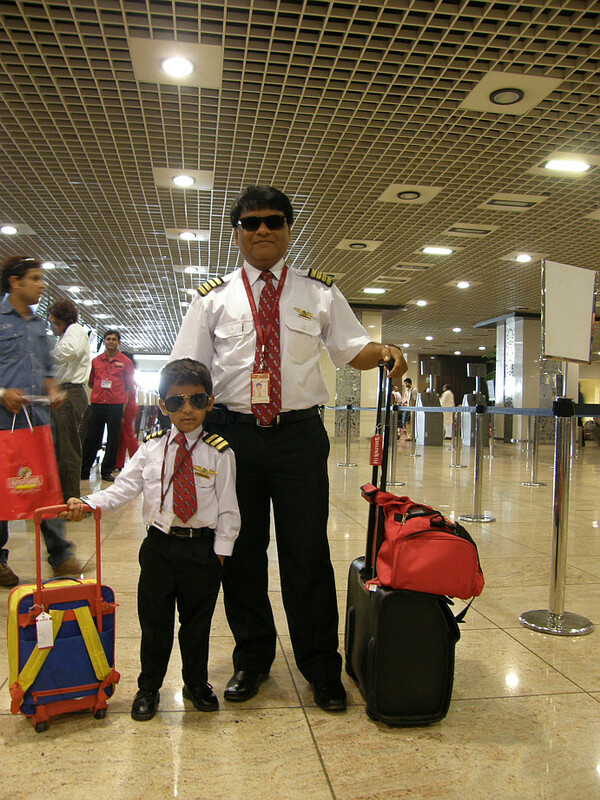 first officer seems to be more stylish than captain…………..ready to put more glamour in aviation, keep it up! !